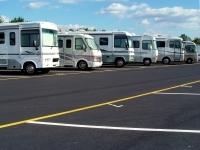 This site started a while back when Teri and I went shopping at an RV show. I talked to several salesmen, even the sales manager, before I realized that, yet again, the salesmen had me totally outclassed. And why wouldn’t they? They saw people like me every day. On the other hand, I’m just a poor yokel who buys an RV once every 5-10 years. For better or worse, I get a bit obsessive when I want to learn something. Anyway, this site is the result. I’m not there yet, but we’re off to a good start! E-mail me at this address: bill at rvsleuth.com (replace "at" with "@"). If you use the info on this site to save money on an RV, please tell me about it! It will make my day. I’d love to add you to my list of RVers who have saved thousands!